April 21-24 is Hope For Three Weekend where we’ll commemorate national Autism Awareness Month with a film debut, a family forum and fun during the annual Strike-Out Autism. Hope For Three Weekend wants to support families living with the rising epidemic of autism. 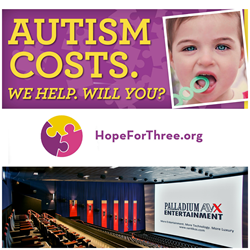 Announced today, Hope For Three and the Santikos Palladium Theater will partner to host Hope For Three Weekend, a massive three-day series of events addressing the issues of autism, in Houston, April 21-24. April marks National Autism Awareness Month, a growing concern in the country as one in 45 children are now diagnosed on the autism spectrum, according to The Center for Disease Control. Hope For Three has created a weekend of support, information and fun for the autism community. Events will be held at the Santikos Palladium Theater off Grand Pkwy and W Belfort in Richmond. Anticipated attendance is approximately 1,500-2,000 guests over the course of the three-day event. “Hope For Three believes it is important to unite the entire community in one location to learn how we all can better support families living with the rising epidemic of autism spectrum disorder,” said Hope For Three Executive Director Matt Jackson. Through a legacy gift established by the late John L. Santikos, Santikos Theaters, a subsidiary of Santikos Enterprises, now operates as a social enterprise that exists for the sole purpose of supporting its local communities. Through donations, grants, sponsorships and in-kind giving, Santikos supports initiatives such as this and many more to help strengthen the community and enrich lives. A red carpet screening of the award winning, autism-related short film, Keep The Change. This invitation-only kickoff event will gather about 250 leaders in business and industry, government, medicine and media for a cocktail reception and show of this compelling movie. Saturday, April 23, 2016, 9-11 a.m. The State of Autism In Texas: A Family Forum will assemble experts in the field of autism as it relates to education, insurance, treatment, government and law enforcement. Hope For Three organizers will moderate a lively and informative discussion around the issues of autism and its effects on the lives of individuals, families and our community. This event is free and open to the public. Registering online in advance guarantees participants a swag bag full of resources and information from local providers. Registration can be found at http://www.hopeforthree.org/event/forum/. Sunday, April 24, 2016, 9 a.m.
Join the mayors of Fort Bend County and the community at large for the 4th Annual Strike Out Autism. This event is a celebration of the autism community through a family fun day, hosted for approximately 100 families with children on the autism spectrum. Families are asked to register in advance online at http://www.hopeforthree.org/event/strikeout-autism-2016/. Hope For Three is still looking for and accepting sponsors for the weekend event. For more information on the weekend event and sponsorship opportunities, visit http://www.hopeforthree.org/events. Hope For Three is a five year old nonprofit organization that addresses the urgent need to provide resources, support, including financial assistance to children with an autism disorder. Our primary purpose is to bridge the gap between families and providers so children have access to high-quality treatment at the earliest stage of life possible. The annual cost of care for a child with autism is around $60,000. We all know the financial stress that this can bring on any family, with the support of partners like Santikos Palladium we can make a difference in our families’ lives. Learn more about Hope For Three at http://www.hopeforthree.org.